Much is made over any number of verses in the Bible that people will point to as a proof text for election, or Calvin’s notion of “unconditional election”, the idea that God chooses who will be saved and who will be damned. One such verse is Matthew 22:14. To the casual reader (which unfortunately describes many “Christians” these days who are not good students of scripture but rather leave the heavy lifting of study and critical thought to some “authority”) it would appear that Jesus is indeed stating that people are chosen. For those of you who are like me and are not casual readers but actually do think critically, a simple observation of the context and grammar of the passage shows otherwise. This verse comes at the end of the passage where Jesus gives the parable of the marriage feast. Jesus compares the Kingdom of Heaven to a king who prepares a grand feast for his son’s wedding. In the passage, the king sends out invitations, but only a few accept the invitation. The king then offers the invitation to more and more so that the wedding feast will be full of guests. The ones who reject the invitation are cast into outer darkness. Among other things this parable teaches, one is that the “church” is not the Bride of Christ, but rather the “church” are the guests at the wedding. But this passage also gives us a clear understanding about the real doctrine of “election.” There is a distinction made between those who are given the invitation to come to the wedding and those who accept the invitation. It should be noted that those who reject the invitation do so by their own choice, not because God pre-ordained them to damnation. I think the reason the concluding verse of this passage is so confusing, aside from man’s attempt to use orthodoxy as a means to control, is because of the lack of clarity in the grammar in all English translations. The key to understanding Matthew 22:14 is that we must recognize something that is clear in the Greek but not so clear in English. The words “called” and “chosen” are adjectives and not verbs. This means that the words identify or describe a particular group and do not indicate an action. If we assume, as the common assumption is, that “called” and “chosen” are verbs, that is not necessarily a problem with the first clause. It speaks to the sending out of an invitation. To say that many “are called” is to acknowledge that an invitation is indeed given out to men- men are called to the wedding feast; men are called to accept salvation. But if we project that same grammatical usage onto the second clause, then we would necessarily be forced to accept the idea that the ones who respond to the invitation do so not by personal choice but by God’s determination alone. But this conclusion presents us with two rationally inconsistent ideas. Why would God bother to invite all mankind if He was only going to choose a few? Let’s take a look at the grammar of verse 14. Here I have taken an excerpt from my electronic interlinear Bible that shows the verse parallel with the Greek text. The notations below the Greek indicate the part of speech and usage. The first thing I want you to notice in this verse is that there is only one verb. The word “are” in the second clause “few are chosen” does not appear in the Greek text. Your Bible probably indicates this by having “are” italicized. As you can see by the notes above, the verb used is equivalent to the English word “is” or “are”, and it is used here in this verse as a linking verb. When a verb is a linking verb, that means the subject and predicate can be switched, and the meaning of the clause remains the same. So you can see by grammatical analysis, that the idea of “chosen” doesn’t specify an action upon a group but instead it identifies or labels a group. What you have in this verse is the identification of two sets, one named “The Called”, and another named “The Chosen”. In addition, we are given some indication as to the relative size of each group, many and few. Please keep this in mind as we move on, this is important: these are not actions, they are people groups! Moreover, the second group is a subset of the first group. Let me give a more mundane example to help illustrate my point. 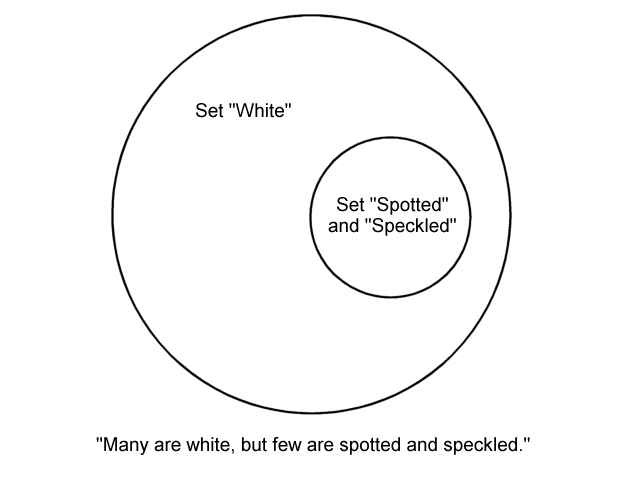 Notice that “white” and “spotted” are not verbs or actions that describe something happening to the goats, but rather they are labels given to identify the larger set (white) and the subset within that larger set (spotted/speckled). To say that a number of goats are white isn’t saying something “whited” them. Likewise to say that a number of goats are spotted isn’t saying something “spotted” them. They are not goats on which somebody performed the act of speckling and spotting. It is a label only. 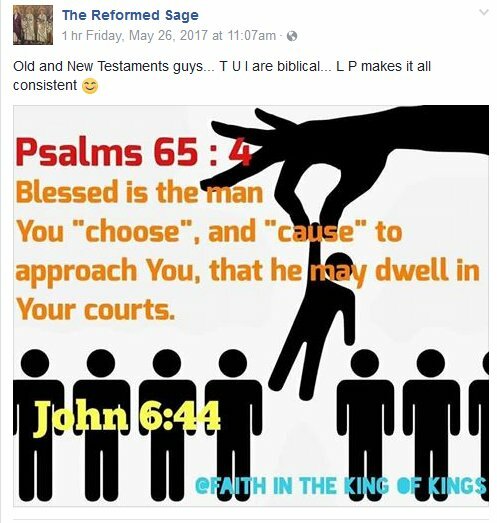 In this same sense, in Matthew “called” and “chosen” are not verbs or actions that describe something happening to the subject, but rather they are labels given to identify the larger set (“The Called”) and the subset within that larger set (“The Chosen”). Said another way, they are not the subject on which someone performed the act of “choosing”. It is a label only. Let me use another mundane example. This one is a little more personal to me, but if you have kids you can probably relate. My five children (even the almost 16-year-old!) love to build with Legos. In fact, you could probably say that we do our fair share in keeping the Lego company solvent. We have TONS of Legos. Let me use one more example. My son’s birthday is coming up soon. Let’s say I have decided that I am going to host a birthday party, so I am going to send out invitations to all his friends and our family. Let us also say that I decided two months ago that I was going to host this party. And when I decided to host this party, I also decided that everyone who comes to the party will receive a door prize; a small bag of candy and other treats. Now let us assume that I send out 100 invitations, but only 20 guests show up. Those 20 guests will receive the door prize. Remember, I decided that two months ago. So it could be said, that many were invited to the party, but only a few showed up to receive the prize. Now consider this. Did I choose who would show up? No, of course not. I chose what they would receive when they got here. While I did not actually choose who would show up, the ones who did received the prize. Whoever showed up was a result of those individuals who decided whether to come or not. Those to whom I sent the invitations could be referred to as “The Invited.” Those who showed up to receive the prize could be referred to as “The Prized”. So, many are Invited, but few are Prized. Now consider this passage at the beginning of Ephesians. This is another favorite passage that many use as a proof text for the doctrine of election and determinism. But look carefully at what the apostle Paul is saying. The scenario is the same as that of the birthday party example. Careful examination of the grammatical structure of this passage makes it clear that God did not choose who would be saved. God chose what those “in Christ” would receive. “The Called” are those to whom God sent out the invitation to receive eternal life. “The Chosen” are the ones who accepted the invitation and received the gift that God chose to give to all those who accepted the invitation. What is remarkable about these conclusions is they are rationally consistent with the rest of what scripture teaches about soteriology. There is no need to perform theological gymnastics in order to force together contradicting conclusions or simply dismiss one or the other altogether. Protestants: Willing Participants in a Truman Show Reality. Truman Burbank lived a seemingly normal life. He was just your regular, ordinary kind of guy. Everybody liked Truman. He had a pretty wife, a nice house, a good job. He had everything anybody could ask for. His life was perfect. Or so it seemed. Of course, Truman Burbank isn’t a real person. He is the titular fictional character in the 1998 film The Truman Show. Those of you who are familiar with the film well know that while Truman’s story is fictional, the reality of his world in that fiction was fiction as well; a fiction engineered specifically for him. The problem was, Truman did not realize that his reality was fake. Unfortunately, just like Truman Burbank, 99% of Protestants don’t realize that their reality as they know it is just as fake, yet they willingly accept it. Truman Burbank offers a perfect philosophical metaphor, so I am using him to illustrate my point. At the time we meet him in the movie, Truman is approximately 30 years old. From the time he was born, his entire existence has been in the world of Seahaven, FL. It is the only reality he has ever known. And up until now he has never questioned the truth of his reality. What he does not know is that this world is a carefully crafted façade, and every other person in his reality is nothing more than an actor playing a role. Their sole purpose is to make Truman believe that everything he sees around him and everything that happens to him is real. And as he goes about his daily life, hundreds of tiny hidden cameras capture his every move and broadcast his life to the world 24 hours a day. You could say that Truman was the first reality TV star. How is it that a person can live his entire existence and not realize that his reality is fake? Because Truman’s reality consists of a very deceptive hermaneutic. Everything that happens in his life is carefully interpreted for him so that his understanding of reality remains consistent with what he observes. On this scale you can be sure that this is a very complicated feat to pull off for thirty years. Such a task can only be maintained for so long, and eventually, unexpected “glitches” begin to occur. For example, one day a strange object falls from the sky and smashes on the ground just feet from where Truman is standing. It happens to be a stage light that is labeled, “SIRIUS (9 Canis Major)”. On another day, while listening to the radio in his car, his radio suddenly begins broadcasting the director’s instructions to the cast, and Truman realizes that the voice on the radio is describing every turn he makes in his car. Yet another time, Truman enters an elevator only to realize when the door opens that no elevator is there but instead he sees a group of stage hands on break around a snack table. Obviously, such events would be out of the ordinary in Truman’s reality. Here is a conflict between what Truman thinks to be true about his world and what he observes, and he has no idea how to reconcile these contradictions. At this point a mediator is needed to reinterpret what Truman has observed to reconcile the contradiction and convince him that nothing is wrong, everything is as it should be. No, that wasn’t a stage light that fell from the sky, it was a part that fell off an airplane flying overhead. No, you didn’t really hear a guy on the radio announcing your every move. Our station accidentally picked up police frequencies, ha ha, sorry it sometimes happens. Oh did you hear? There was a freak elevator accident in the building next to yours, and a woman was critically injured- no you didn’t really see a stage crew taking their break where an elevator should have been. The producers went to great lengths to discourage Truman from leaving Seahaven, because as a boy, Truman had a longing for exploring. They posted subtle messages around town with outrageous warnings about the dangers of travel. Sometimes, drastic intervention was required. They even created a scenario one day where Truman was out on a boat with his father, and a sudden storm swept his father overboard, never to be found again. Of course, it was all an act, but to Truman it was very real, and it made quite an impression on him as a small boy. So much so that Truman developed an acute fear of the water and never thought twice about leaving Seahaven by boat, or even crossing a body of water. But as things progress, Truman’s suspicion grows. He begins to ask serious questions of those around him, who continue to simply play along with their roles in a vain attempt to deflect his suspicions. But despite all these obstacles, Truman was determined to find answers to his questions. He discovered that he could make unusual things happen anytime he was unpredictable. Those involved with the show could not react fast enough to his spontaneity, and this would give them away, only furthering his resolve. Truman knew something was not right about his world, but he did not know why. He could not explain it, but he was no longer willing to accept the explanations given to him by those around him. Truman’s understanding of the world was based on a false assumption. From time to time Truman would encounter contradictions in his reality that he could not reconcile. Truman needed mediators in his life to interpret reality for him. In much the same way, the way that Protestants understand reality is based on a false assumption. Doctrines such as total depravity (total inability), determinism and God’s sovereignty, election, and many others present man with a view of reality where man is evil and therefore cannot know truth. Believers go to church week after week so that they can be told not just what to think but also HOW to think about not just what the Bible says but also how the world itself works. Most often, contradictions are handled from a matter of interpretation. This is where the mediator steps in and reinterprets scripture for the believer in its proper “gospel context”. You see, because man is unable to know truth, he needs the authority of a mediator to explain it to him. This is the role of pastors, elders, deacons, bishops, et al. For Truman Burbank, his mediators were not just a select few in positions of authority. It was the entire cast of characters from the crew behind the scenes, to the actress who played his wife, to the guy who sold him his daily paper at the newsstand. Every person in Truman’s life was a willing participant, regardless of how much they were aware of their overall impact in shaping his life. Extras in the cast, for example, would dutifully play their part all while being totally ignorant of the ultimate level of control the producers sought to wield over Truman’s life. Truman himself was a willing participant in this ruse. One could argue that he was simply an innocent victim in the whole matter, but consider how much he was willing to overlook in his life for such a long time just so that he could go on living the only life he ever knew. That fact was a major point in the film, when a former cast member called the show and told the show’s creator just how wrong she thought it was the way they were using Truman for their own ends. The creator’s response was profound and powerful. He said that if Truman REALLY wanted to discover the truth, he would find a way, and that whenever that happens, there would be nothing they could do to stop him. The point being of course was that the mere fact that Truman lived this life for so long was a statement to the reality that he really didn’t want to know the truth. How much can the same be said of Protestants? 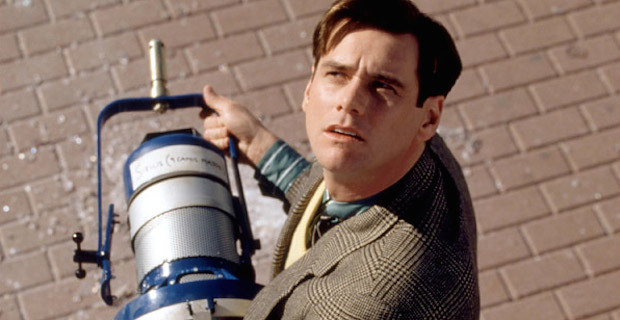 To what extent are Protestants willing participants in their own “Truman Show” existence? How much are we willing to overlook just so that we can be comfortable in our lives? How much abuse and evil are we going to tolerate just so that we can have some sense of security in where we think our salvation lies? Do we blame the cast of mediators who create this charade for us? Their role is obvious, and they play their parts well, wittingly or unwittingly. But the laity are playing a role as well. They shoulder just as much of the blame as those under whose self-appointed authority they have placed themselves. And they will dutifully pay their tithes and offerings each week, and they will warm their spot on the pew every time the church doors are open, and they will sing when told to sing, and they will stand when told to stand, and they will pray when told to pray, and they will outsource their minds to someone standing before them who will tell them what to think about life. And they will never ask a hard question, even when a stage light falls from the sky. But there is hope! Because if Protestants really want to know the truth, they will find it. If they really want to find a way out of the nightmare that is the institutional church, they will discover it. And when they are determined to do so, there isn’t a thing the church can do about it! The translators of this verse made the assumption that the object is man or the individual. God chose man. But if you look closely at the verse, there are many words in italics. This means the words do not appear in the manuscript. Try reading that verse without the italicized words. What if the object is not man but God Himself? What if God chose to dwell with man? Let me use another mundane example. This one is a little more personal to me, but if you have kids you can probably relate. My five children (even the almost16-year-old!) love to build with Legos. 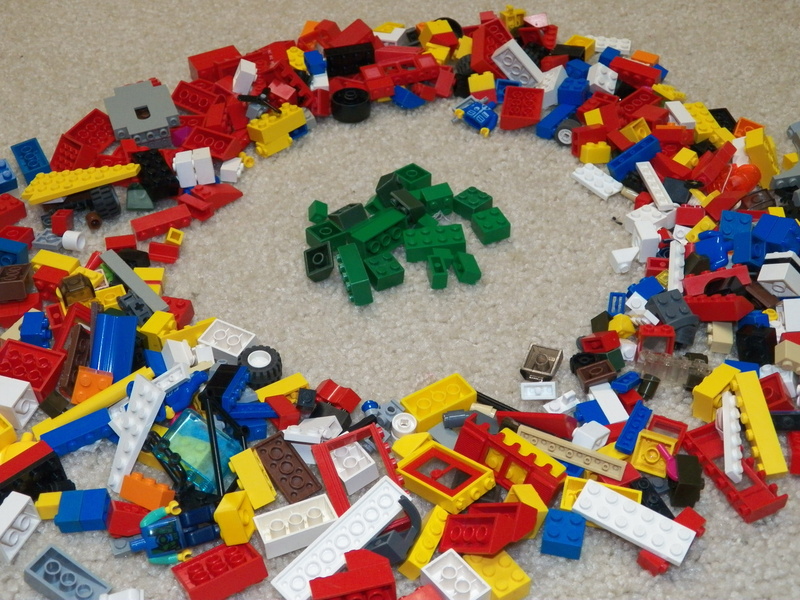 In fact, you could probably say that we do our fair share in keeping the Lego company solvent. We have TONS of Legos. Let me use one more example. My son’s birthday is coming up soon. I have decided that I am going to host a birthday party, so I am going to send out invitations to all his friends and our family. I decided two months ago that I was going to host this party. And when I decided to host this party, I also decided that everyone who comes to the party will receive a door prize, a small bag of candy and other treats. Now consider this. Did I choose who would show up? No, of course not. I chose what they would receive when they got here. While I did not actually choose who would show up, the ones who did received the prize. Whoever showed up was a result of the individuals who decided whether to come or not. Those to whom I sent the invitations could be referred to as “The Invited.” Those who showed up to receive the prize could be referred to as “The Prized”. So, many are Invited, but few are Prized. Careful examination of the grammatical structure of this passage makes it clear that God did not choose who would be saved. God chose what those in Christ would receive. 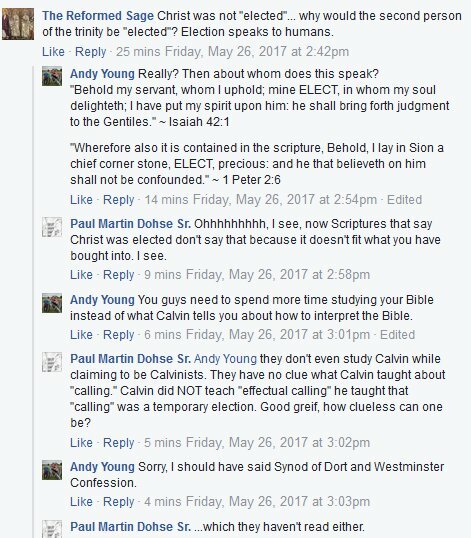 During the “John Piper On Deck” session, Paul Dohse takes on John Piper regarding Calvin and “election”.